Where on earth did the weekend go? I can't believe it's Monday again! The new Starbucks at the Mal opened this week, although there are quite a few lovely looking independent coffee shops in Newcastle I haven't got round to trying many of them yet and I will admit that having worked in London for years I do sometimes miss having a Costa or Starbucks on every street corner. So I was pretty excited to know that we were getting a Starbucks so close to my office. The day before opening they decided to let the locals on the Quayside have a little bit of a sneaky peak and some free coffee. The staff are really lovely, and the shop looks really good. I'm not yet sure how I'll be able to handle being that close to eggnog lattes when Christmas comes round. Simon's Mum came to visit this weekend and unfortunately the weather wasn't very kind so we did most of our entertaining in Eldon Square, taking her round the shops and showing off the gorgeous Garden Kitchen at lunchtime. 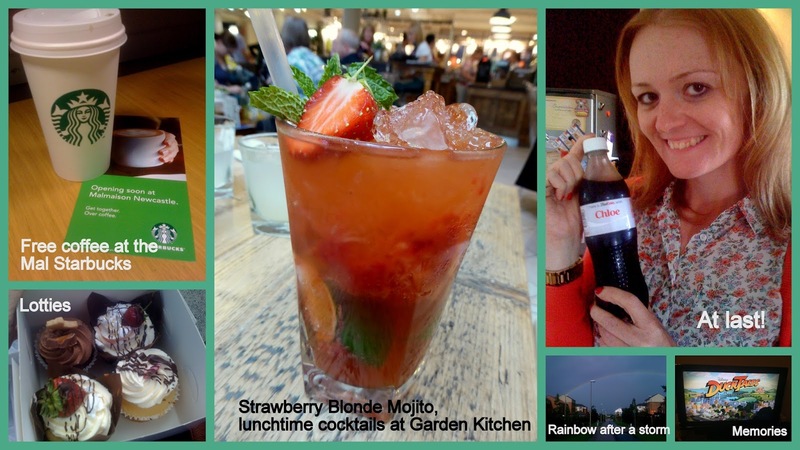 I decided to indulge in a lunchtime cocktail and treated myself to a strawberry blonde mojito. I also finally managed to get my hands on a "Chloe" coke bottle. I will admit that I have gone slightly crazy since the "share with friends" promotion began and have been known to tear a few displays apart in the supermarkets looking for my name. I could pretend that my hunt paid off, but I'm rather ashamed to admit that I actually stood in line at Tesco in Gateshead to get my name put on a bottle. I think Simon is probably pretty chuffed I have one at last as he's had his Simon for many months now and I wouldn't let him drink it until I found a Chloe! Can feel myself wanting to blitz the clothes shops again soon, A/W 2013 has hit many of the shops and I'm itching to have a proper look. I already have my eye on some lovely boots in New Look that I'm planning on purchasing on pay day and I picked up a gorgeous dress in Primark at the weekend which I will be blogging about later in the week.